This incredible mural is painted on glass tiles, and can be seen at the Kemper Museum of Contemporary Art. Several tiles were broken or missing, and were replaced while the entire mural was carefully taken down and moved to a new wall. 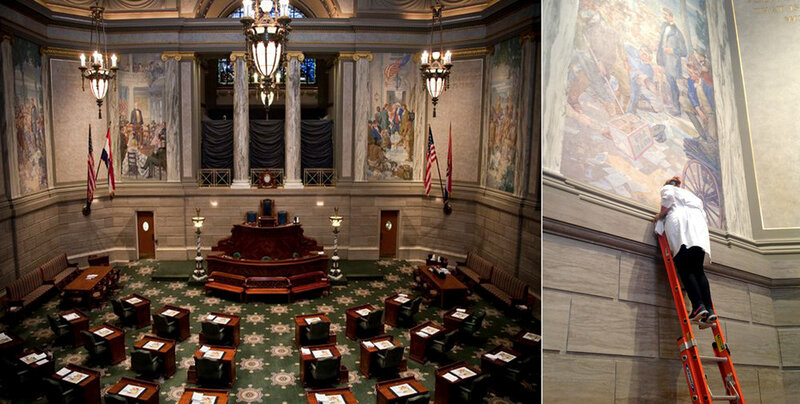 The House and Senate Chambers have giant murals on the walls. They are in remarkable condition, as our surface tests confirmed. The Capitol is filled with incredible artwork, including dozens of murals, which are subject to the normal aches and pains of being painted on one hundred year old walls. This incredible French mural was digitally reproduced and hung on a vaulted ceiling by a team of talented wallpaper hangers. The fragile original was stabilized so it could be hung in a more conventional space. The mosaic entry to these elevators needed to be cleaned and have some overpainted wall paint removed. VWFA removed this historic mural from the lobby wall inside the Ambassador Building in midtown Kansas City because the building was being demolished. It is currently stored and for sale at VWFAC. We are no strangers to getting up on a scaffold, ladders, and even cherry pickers to reach difficult places. This historic mural was relocated to the National Agricultural Center in 2004. Damage caused by the move was substantial and VWFA was tasked with the reconstruction of the cement and plaster wall and restoration of the mural. It is now installed in the National Agricultural Hall of Fame. This beautiful mural in Kansas City, Kansas was water damaged from a leaky roof. 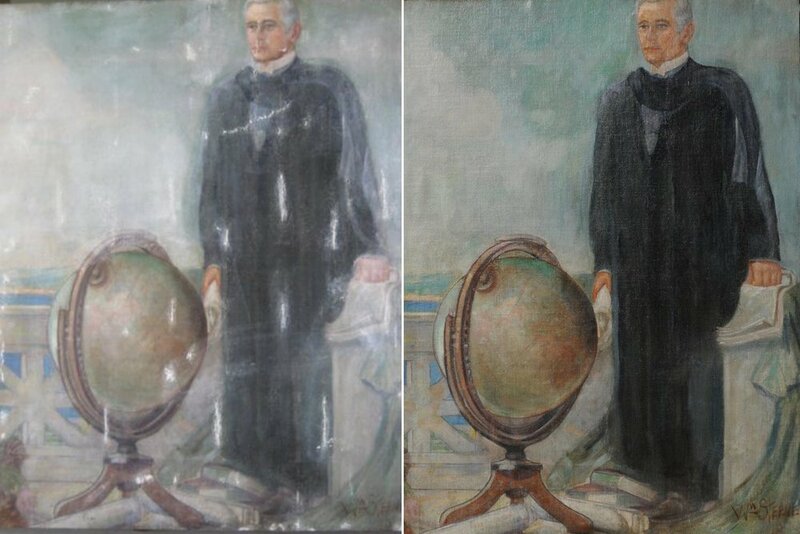 The painting was cleaned and water streaks were retouched. 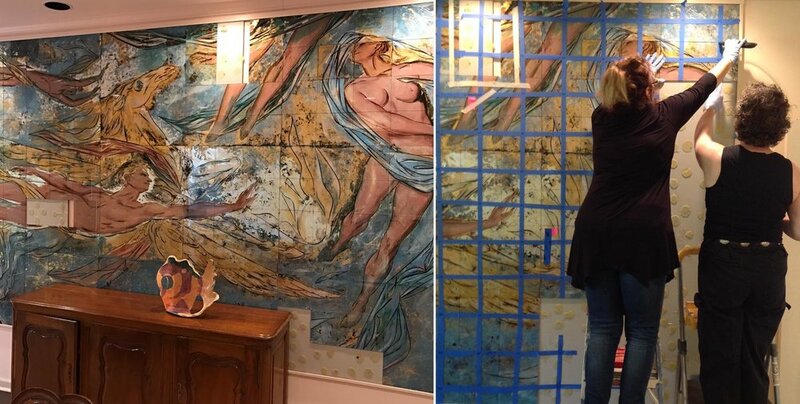 This mural is in the collection of the Westport Historical Society in Westport, CT.
One of our fortes, we bring three generations of expertise to historic mural conservation and restoration. We offer industry-leading technical expertise and our comprehensive services include condition and treatment reports, accompanied by photographic documentation. Museum standards and methodologies, which adhere to the American Institute for Conservation’s Code of Ethics and Guidelines for Practice, are the hallmark of our practice. Throughout the process, the artist’s original intent, along with the integrity of the work, are top priority. 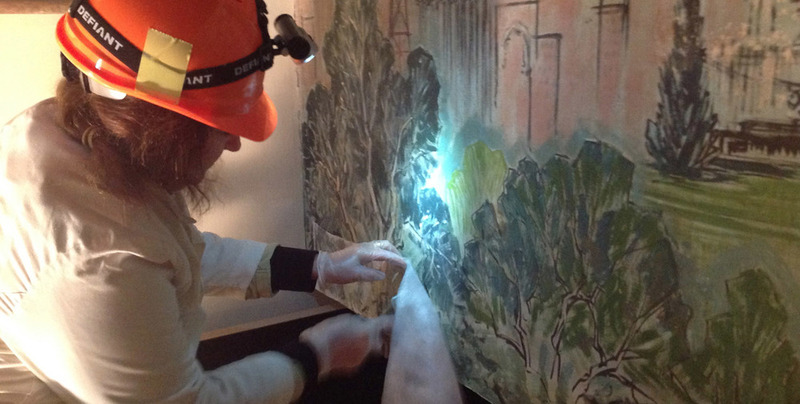 Our mural restoration process begins with a thorough visual inspection, along with documentation of present conditions and materials. Additionally, we perform a scientific and technical analysis to identify and develop an appropriate treatment plan to clean and restore the mural. Following the examination we provide a Treatment Proposal to determine the scope of work. The Proposal aims to balance science and art, while simultaneously considering the mural’s history and environment. 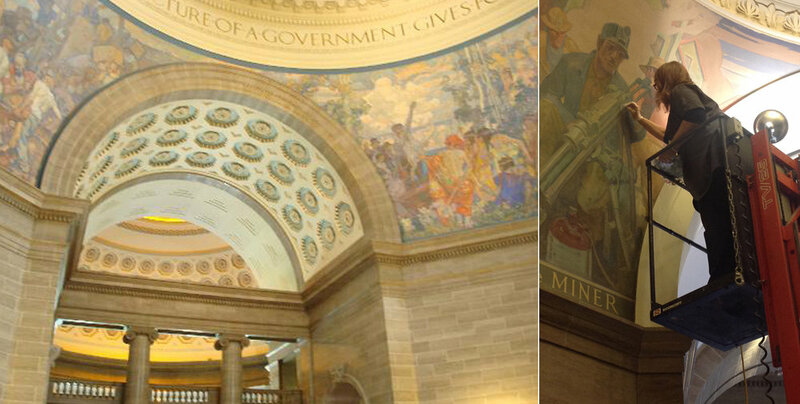 Our mural conservation clients include local governments, courthouses, museums, historical societies and other organizations. To inquire about your mural restoration project, call the studio or send a message and we’ll get back with you. Our expert team spent an entire day removing this mural from a wall in the Nevada Public Safety Building, where it had hung for over 40 years. It was then covered with silicone paper, rolled onto a giant cardboard cylinder, and stored in a plastic bag to keep it clean for a future re-installation. Read an article about this historic Nevada mural move. Visitors to the National World War 1 Museum will see this masterpiece, which has been described as the world's biggest painting. This extraordinary mural had to be cut into four pieces to be moved to its new location in Bonner Springs, Kansas. Van Witt Fine Art Conservation was on hand to put it back together. Cathi Hahner, the National Agricultural Hall of Fame's executive director, poses happily in front of her newly repaired mural. This 15-foot mural had been rolled up in a warehouse for decades. 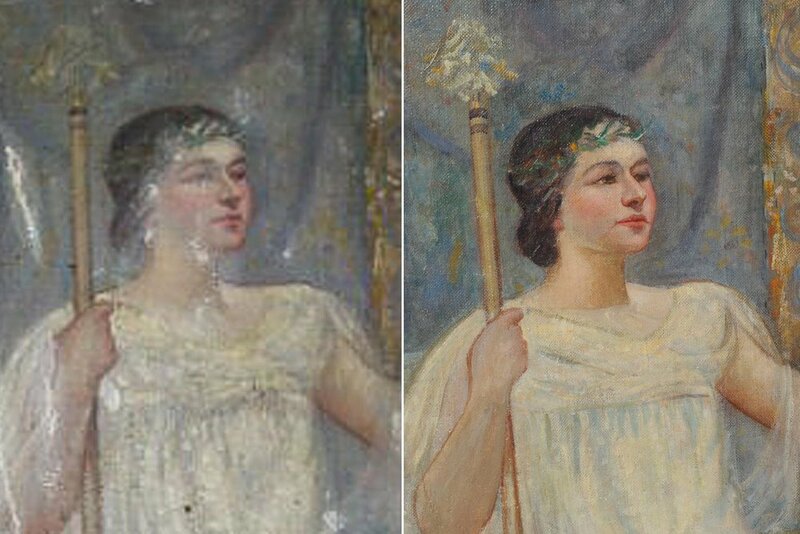 Van Witt Fine Art Conservation was tasked to clean and restore the mural from years of accumulated airborne grime, old adhesive and discolored varnish on the verso.